Grim Fandango is a classic. Originally released in 1998, Grim Fandango is often cited as the last of the truly great adventure games to come from Lucasarts. It's a game that mixes numerous complex themes and elements. Creator Tim Schafer recently announced that a remastered version will be coming to PC, Mac, Linux and PS4. I can think of no better game to close our Pumpkin Preview. 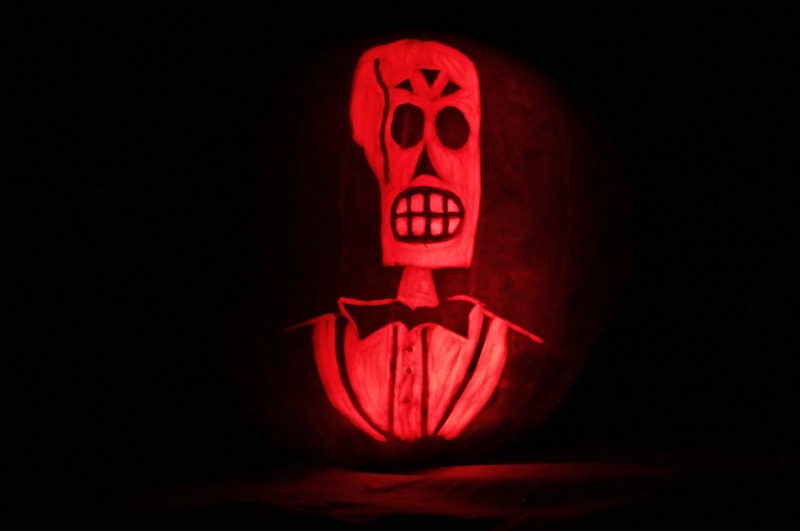 At its heart, Grim Fandango is a dark comedy noir story about Manny Calavera, a travel agent at the Department of Death. Tasked with selling travel packages to the recently departed to speed their journey (depending on how virtuous they were in life). When he meets Mercedes "Meche" Colomar, Manny's life changes. Soon he is swept up in a tale of corruption and greed that pull elements from older Aztec legends and mythology and combines them with huge Art Deco designs and the witty repertoire of movies like The Maltese Falcon. Tim Schafer has said in numerous interviews that Grim Fandango is one of many games from Lucasarts that he'd like to bring back; Grim Fandango just happened to be the first one they attempted. The witty and thoughtful writing, coupled with the fascinating environments and compelling story make it a natural choice for a remastered version.